Easter is prime time for spring skiing with the family, not searching for hidden plastic eggs on your frozen brown lawn. Our family has made a tradition of Easter on the slopes. Easter Sunday varies each year, it canbe late March to mid-April. Obviously spring conditions are a huge variable as well depending upon the winter’s snow and the spring weather for skiing in New England, The Rockies, Canada and Europe. Instead of outfitting your children in frilly Sunday finery, I suggest you pack the ski gear and the sunscreen for an on-snow holiday. Mountain resorts do their part to make Easter a festive event. Easter skiing is huge holiday at Switzerland ski resorts and The Austrian Alps, at ski resorts like Vail Colorado, Okemo, Sugarloaf and Stowe in New England. Churchgoers need not be concerned with missing Sunday service. Ski resorts hold sunrise services, often on the top of the mountain. I can’t think of a more spiritually inspiring setting (though honestly, it takes conviction to make the 5am chair in the dark). In addition to kid friendly activities like Easter egg hunts, costumer parades and pond skimming, and visits from the big Bunny himself, resorts also offer great end of season lift and lodging deals. 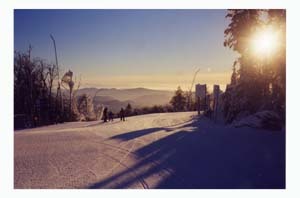 Sugarloaf in Maine and Stowe and Okemo in Vermont offers an ecumenical Easter Sunrise Service, and an “infamous” Easter Bonnet Contest and Parade. Make your own bonnet to parade about and you could win an award, often next year’s season pass. Hint the winners are usually the best ski related theme, particularly if you incorporate the ski resort’s logo into your costume. Branding = winning! 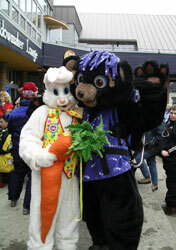 During the ski day, your kids can search for Easter eggs hidden about the slopes or the ski lodge. Lift and lodging special packages for the Easter weekends and the midweek before or after can be the real treasure for parents, especially when it falls on April vacation week. Just be warned ski resorts may no longer be in full operation if its mid April, as they begin closing certain lifts and downsizing operations. Vail and Beaver Creek in Colorado celebrate Easter with an Easter Egg hunt and spring back to Vail live music and pond skimming. Easter at Stowe is a long-standing tradition, over six decades and still going, with an Annual Easter Sunrise Service, a non-denominational church service reached by gondola on Vermont’s highest peak, Mt. Mansfield. This is a fantastic way to greet the sun and start your family ski day ahead of the pack. The wake up run following sunrise service is a religious experience in and of itself. Follow this up with a family breakfast at the base and an Easter Egg Hunt at Spruce Peak. Bretton Woods in New Hampshire invites the Easter Bunny to attend their egg hunt on Sunday, after his basket delivery is complete. The Easter Bonnet Ski Hat Promenade is your opportunity to wear your Sunday best while indulging in your favorite pastime. Sugarloaf in Maine, our usual Easter destination, celebrates their traditional Easter Parade, a perennial collaboration of the most unusual costumes created by Carrabassett natives and Loaf lovers from away. Awards are given for the best costumes (hint: Sugarloaf themed get-ups are usually the prize-grabbers). Amos the Moose and Blueberry Bear are on hand to welcome their special guest, the Easter Bunny. Sunrise service on the Superquad lift starts off the special day at the Loaf bright and early at 5am. Sugarloaf’s northern location, high elevation and significant snowfall usuallys assures great Easter sliding. Sugarloaf ski and stay package prices drop as the temperature rises and crowds dissipate. North of the border to Quebec’s Sainte Anne Basilica would provide an Easter to remember. This is the Mecca, if you will, for cold weather Christians. Since you have made the (6+ hour) trip, you can certainly justify skiing at Mont Sainte Anne for a day or two (or three – the exchange rate is that good). Families staying slopeside at the Château Mont Sainte Anne can walk to the gondola, restaurants and the fun kids’ activities planned for Easter weekend. A two night lift and lodging package is $179 per person Canadian including a welcome drink and Swiss fondue. Spending Easter on the slopes will extend your family’s ski season. I love skiing this time of year. Ticket and lodging prices plummet as the barometer rises, softening the bill and the snow under your boards. 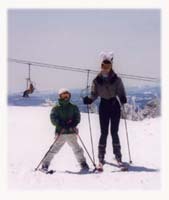 My kids love spring skiing, no more cold fingers and toes. Goggles and neck warmers are replaced with cool shades and SPF30. Pond skimming and costume parades are a fun bonus! Beach parties and barbeques on ski resort lodge decks are great celebration at the end of the season! Say goodbye to flat light, hand warmers and numerous hot cocoa breaks. Say hello to a festive, sunny Easter weekend on snow and a grilled cheeseburger and chocolate bunny in snow paradise! It may well be the start of a new family tradition. If you still insist on buying that fancy hat – you can wear it while skiing in the Easter parade and reveal your inner ski bunny tendencies.